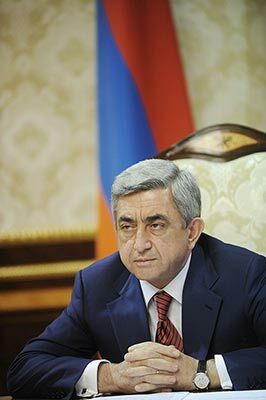 President Serzh Sargsyan has officially responded today to opposition leader Raffi Hovannisian’s suggestions Hovannisian voiced on Friday during a public rally at Liberty Square and sent them to the presidential residence. The incumbent president in his letter to the Heritage leader disputing the recent presidential election results offered to start a dialogue on Hovannisian’s suggestions, despite terming them “rather raw and contradicting the constitution”. Hovannisian who has been on hunger strike at Liberty Square for 15 days, sent his written suggestions to the incumbent president in response to Sargsyan’s statement voiced, during his meeting with press last Monday, that Hovannisian’s demands were not clear. Hovannisian’s demands which he put in writing and made public during the Friday rally include either snap presidential elections, or if Sargsyan wants to keep running the office, he should hold pre-term parliamentary elections by proportionate representation system, fire at least five governors and replace them with people Hovannisan would appoint, and pass over the management of a number of key supervisory bodies to people Hovannisian would suggest. “I thank you for finally accepting my proposal made during our meeting, for putting your ideas on paper and passing them on. However remote the written matter addressed to me from the appropriate notions of the state and state authority formation is and in contradiction with the stipulations of the Constitution currently in force, it nonetheless can be helpful in commencing an effective dialogue. I am glad that you also possess readiness to assume serious monitoring functions which befits strong opposition, and it looks like on that issue our positions are quite close. I am confident that if we start working together purposefully, based on the community of opinions, we will definitely get results. Responses to Hovannisian’s suggestions voiced by members of the ruling Republican party before the president’s letter were mostly of a rejecting character. For instance, RPA vice-president Galust Sahakyan defined the suggestions as “mere compulsion or a wish”, saying that “the weak can never constrain the strong”. Hovannisian team member Styopa Safaryan says the president’s letter is vague, expressing no attitude to Hovannisian’s suggestions. Safaryan sees elements of rejection and an attempt to win time in Sargsyan’s letter.